I didn't have to team lead or assist for the June cert, but I had two students taking it. I decided to go out and show my support. 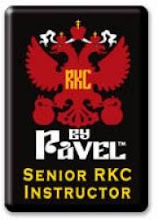 I wanted them to understand that the RKC is more than a certification. They both did great and did me proud. They are no longer my students, they are now part of the family that is the RKC! Congratulations to Diane and Nate it is well deserved. I'm leaving for the Level II in 10 days. We are going to be tested on 5 exercises during the course so I practiced all 5 today. couldn't have made it through without you. i'm going to try to write about the experience in the next few days. but as you know, it is really hard to put into words what transpires at the rkc.